One day last month I was walking down 8th Avenue from Columbus Circle — probably thinking about how cold it was getting outside or pondering what I was going to be for Halloween — when I passed by an blatantly brand new Starbucks on 57th & 8th. Not another one! was my first thought. My second being: OMG, look how small it is! 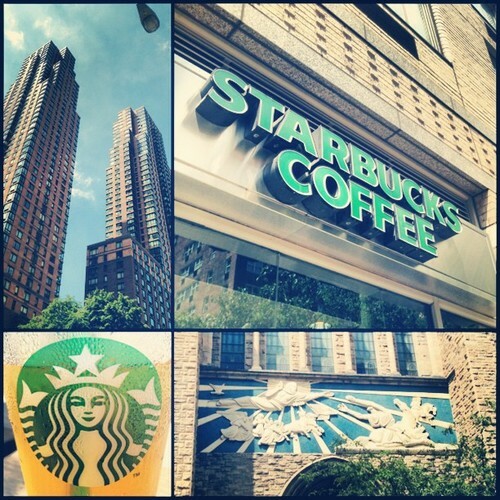 Obviously, I’m the last to complain about more Starbucks popping up in NYC, it’s just that at times it feels like I’ll never be able to visit them all if I can’t keep track of where and when they appear. Luckily, I stumbled by this one by chance. So I quickly made note of it and promised to come back one day. And today is that day. 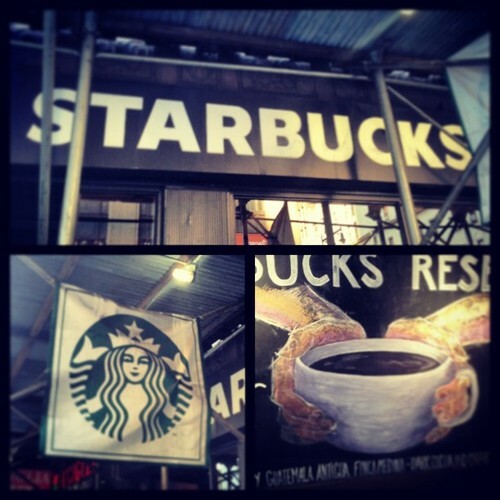 The reason my second thought was on the size of this Starbucks is because it is perhaps the smallest in Manhattan. 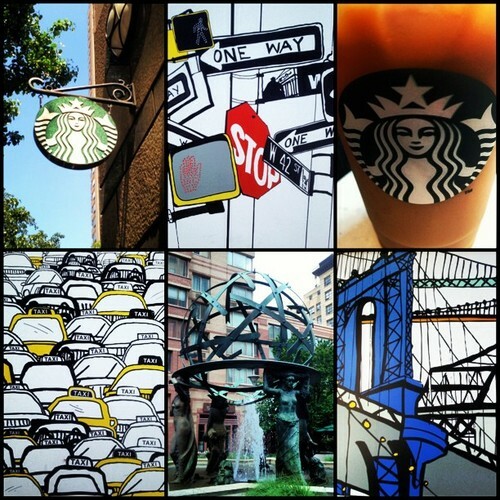 Literally I could see the Starbucks in its entirety just by casually passing by on the street. 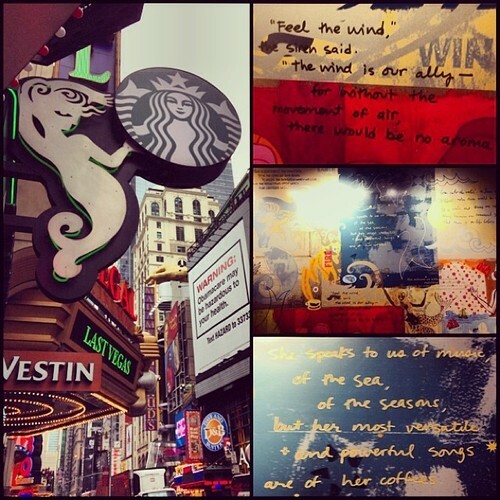 I’m torn whether the Starbucks on 42nd & 6th is a tiny bit smaller or not. Since I’m not about to break out a measuring tape, I’ll call it a tie. This Starbucks has no seats. No restroom. No available power outlets. But, ironically it does offer Google WiFi. When I arrived there was a young woman perched in the corner, half-sitting on a ledge, typing away on her laptop. She left. So can you guess where I’m at now? Yep — that very same ledge. Obviously, this Starbucks isn’t meant for loitering, but it just goes to show that its meager size won’t stop New Yorkers from lingering. I’ve passed by the Starbucks on 42nd and 9th avenue several times, and although never entering, I knew what I would most likely rate this Starbucks months ago. That’s because its exterior wall is nothing but paneled glass. Each time I passed, I could see exactly what was going on inside. 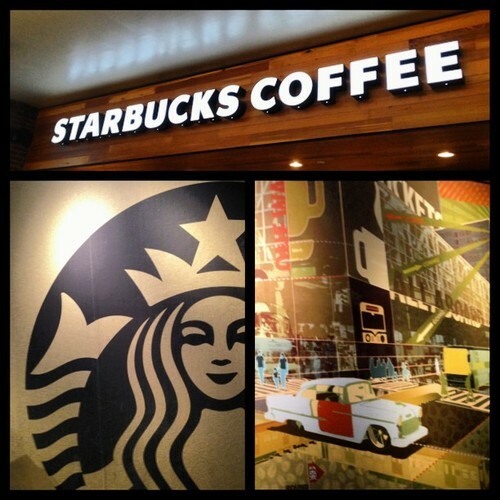 Essentially, this Starbucks is a small space with crowded tables, a consistent crowd and little room for much else. I could even tell there was no restroom just by a passing glance. Although it’s well enough removed from Time Square to not have a giant crowd shuffling by outside, it still attracts enough of a crowd. It’s close to the Port Authority Bus Terminal and just north of the traffic nightmare known as Hellsea. I’m not saying grabbing a seat here would be impossible. Just prepare to wait a while — or arrive early. This bad boy opens up at 6am, Monday-Friday. 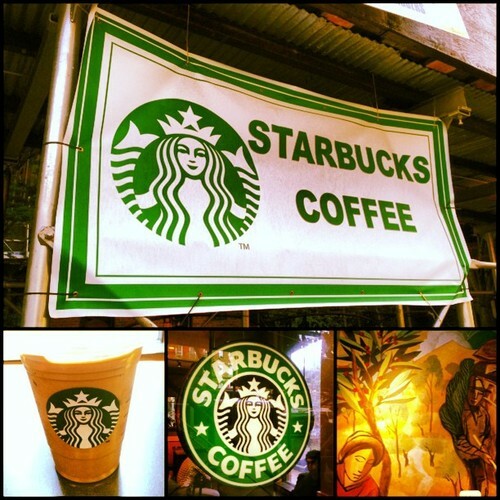 If I had to choose right now, then I would say this location is my “Go-To” Starbucks. 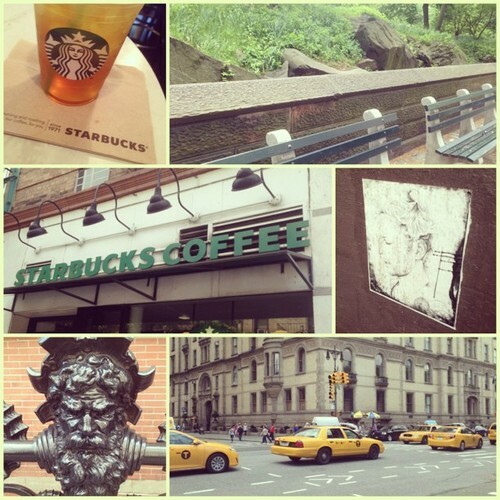 Perhaps the purpose of this entire blog is to find my Go-To Starbucks in NYC? 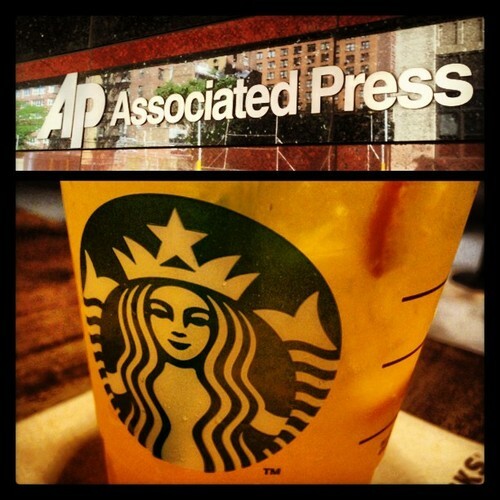 Having a Go-To Starbucks is an important thing. Back in Orlando, my go-to was in a little nook of Downtown Orlando called Thornton Park. It was biking distance from my house and had an inviting inside as well as a splash of outdoor seating that overlooked the cobblestone road. I spent countless hours there doing coursework, studying for the GREs, meeting with friends, reading on astrology, or even just people watching. A good friend and I actually coined the term “Go-To Starbucks” when we new that was where we needed to go to either catch up or talk about something a little more serious. This Starbucks is actually directly between 8th and 9th avenues, but since there is another Starbucks on 49th & 8th, I figured this one can occupy the 9th avenue side for clarity’s sake. By distance alone, this is the closest Starbucks to my apartment. Proximity is very important when determining your Go-To. Also, since this Starbucks is not directly on an avenue, it gets less of a crowd than most, so seating is never hard to find (another important factor). 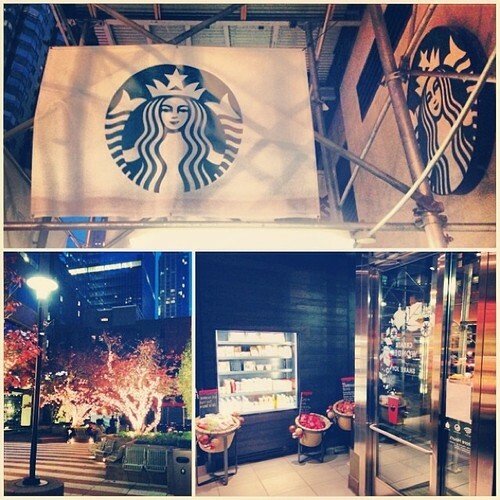 But this Starbucks’ greatest asset is the amazing outdoor plaza that cuts between 49th and 50th streets. Equipped with public seating, a gorgeous fountain, and plenty of greenery, it makes for a perfect sunny afternoon hangout. If only the Starbucks WiFi reached there! There is one threat to this Starbucks’ grand status, and that is the fact that tour buses tend to line up on 49th right outside the courtyard. Weekends or weekdays, they don’t discriminate. When there’s a tour bus outside, the tourists invade this Starbucks like a scene from Mars Attacks. Lengthening all the lines and consuming all the seating. Luckily, if a tour bus is outside I know to go to one of the 3 other locations within a 2-block radius. The Starbucks on 43rd and 9th is another victim of construction shielding draped around the exterior. That’s two in a row! I know NYC is forever changing — updating, evolving, improving (maybe?) — but at times it seems like the entire city is covered by one monumental construction awning. Earlier this year, my street was being torn up in order to get new piping — or at least that’s what I assumed. For at least 2 weeks we would find a notice on our building’s door saying that we would be without water for an 8 hour period starting at 8am. No showers — no flushing toilets — just bottled water to brush your teeth with. Thankfully my gym membership allowed me to maintain a normal schedule. I was reminded of this when I entered this Starbucks and noticed a sign on the door that stated the Starbucks will be closing at 8pm tonight and would resume operating hours tomorrow. Then, on top of that, the 1 restroom has an out of order sign on the door. Strike 2, I think. Then as I take in my surroundings a bit further, I spot the covers on the power outlets. Strike 3. Since 2 of these things could just be happenstance flaws, I’m reserving some judgement. After all, I was able to grab a seat right away, and the environment is welcoming enough to keep me here while I write. 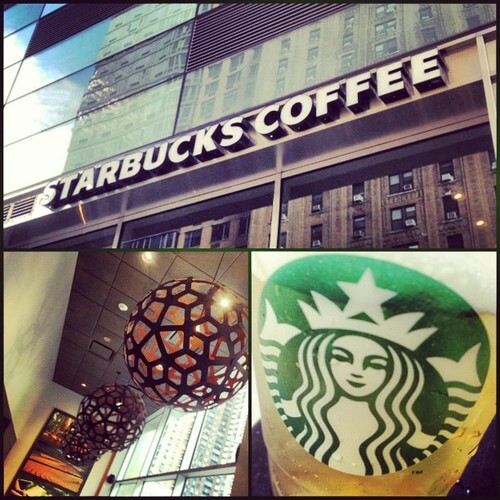 And one of the best things about Starbucks in NYC… There’s surely another one around the corner. If the neighborhoods of Manhattan were competing in a beauty pageant, I feel the Upper West Side would take it by a landslide. Not only does it border Central Park, but it has some of the prettiest buildings and unique architecture (take note of some of the street art and statuary I captured above). It’s less congested, and you can take your time to walk slowly and window shop without becoming a barrier to the go-getters of NYC. Always being a forward thinking person, this train of thought has driven me to the conclusion that the Upper West Side will be the next big gay neighborhood within the next 20 years. The proof is in the past and present. As Chelsea bars begin to close and reemerge in HK, the same thing is bound to happen as rent in HK continue to rise. Also since the city was built up — with the northern neighborhoods being newer than the south — there is more room to spread out here. Building on this stereotype even further, this inevitable migration of gay men with their expendable incomes will certainly lead to more Upper West Side Starbucks. I really hope you can read the jest in my voice here, people! This Starbucks on 73rd & Columbus is a good example of why I have not grown bored of visiting Starbucks after Starbucks here in Manhattan. Every now and then I stumble upon one that is distinctive enough to keep me pushing forward on my coffee-colored journey. This location is small but brewing with charm. It’s angled, glass-paneled walls and dark espresso decor attracted me immediately. Then I saw the little seating area separated by a mirrored half-wall and the adorableness factor of this location increased considerably. I believe this to be the first open mirror I’ve seen at any Starbucks so far. Although the restroom line runs long, I still recommend this as a homey and brightly lit Starbucks to spend some time in while on the Upper West Side.